Set up specifically for tourism, the Ayutthaya Floating Market covers a considerable stretch of canals just south of Wat Maheyong. You won’t find farmers selling their produce at sunrise, or even many boats at all, but the market will do the trick for a bite to eat if you’re in the area. Most of the vendors occupy stalls on either side of wooden walkways set up directly over the water. We saw only one vendor preparing food on an actual rowboat when visiting on a weekday. Several sit-down eateries serve noodle dishes, rice plates and Isaan food to dining decks beside the water, while others provide finger foods and drinks to go. There’s also no shortage of Ayutthaya T-shirts, key chains and trinkets. The majority of visitors are Thai. The market is liveliest on weekends, when you can watch traditional Thai dance and music performances. Boat rides are also available, and an elephant camp employing animals trained at the Royal Elephant Kraal offers rides around the nearby ruins to the south of Wat Maheyong. Last updated on 29th February, 2016. 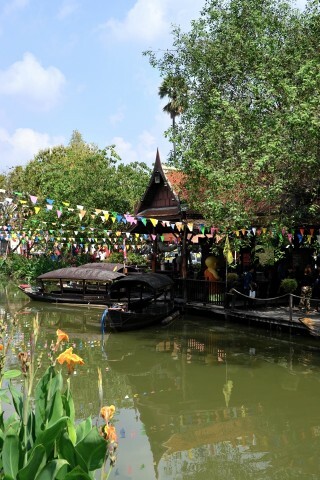 Ayutthaya Floating Market is open daily and marked by signs off Route 3058, about a kilometre north of the Sam Pluem Chedi traffic circle in East Ayutthaya.